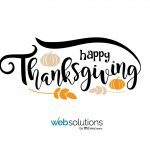 We are so grateful for all of our clients, WebCenter Owners, and staff! We appreciate everyone’s efforts and are thankful we can bring such high-quality digital marketing products and services. Our offices will be closed on Thursday, November 22nd through Friday, November 23rd to celebrate Thanksgiving. We resume hours on Saturday, November 24th with our Customer Care and Tech Support.